Everything you said in that last sentence was incorrect. hehe. So the sweetie and I went to see Star Wars: The Last Jedi at Dendy last night (an 8:30pm session so hardly any kids just a couple of teenagers). Generally I quite liked it. Although that was helped by hearing a few people say they either didn't like it or were indifferent to it. I didn't watch any trailers, and I didn't read any reviews, so I had no expectations whatsoever, which is how I like to see movies. So The Force Awakens was essentially a remake. I called it a love letter to the original movies. This one felt a lot like a remake as well. There were an awful lot of parallels between this and Empire Strikes Back (master and apprentice training in a remote location, battle of Hoth etc), and a bit of Return of the Jedi in there as well (throne room stuff, stoopid cutesy creatures (seriously wtf?)). Then there was the Harry Potter stuff (Rey/Kylo Ren connection like Harry/Voldemort, Mirror of Erised and trying to know parents). But. John Williams!! It was so cool to see/hear the opening yet again in a cinema. 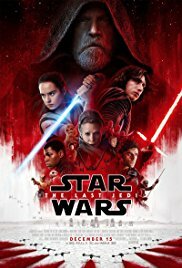 I've seen every Star Wars movie in the cinema except for A New Hope. And all the leitmotifs for all the characters were there, to the point that any new stuff was kinda secondary. It was cool seeing Billie Lourd in a bigger role too. It was pretty long, but I enjoyed it. Be interesting to see where they take the next movie.